Brain and the majority of the tissues of the head and neck are emptied by internal jugular vein. First it starts as the direct continuation of the sigmoid sinus in the base of the skull below the jugular foramen and then by joining the subclavian vein to create the brachiocephalic vein it descends vertically downwards to finish behind the sternal end of the clavicle. The internal jugular vein is biggest vein of the neck. Since it drains the blood from the bigger superior sagittal sinus, c.f. the left internal jugular vein drains blood from the smaller inferior sagittal sinus, the right internal jugular vein is generally bigger compared to the left. First, at its orgin point which is located at the jugular fossa of the temporal bone. It’s called superior lightbulb and is linked to the floor of the middle ear. Second, close to its conclusion which is located in the lesser supraclavicular fossa between the sternal and clavicular heads of sternocleidomastoid. It’s called inferior lightbulb and is safeguarded by a set of valves. It’s vertically applied to the lateral side of the internal and common carotid arteries, enclosed with them and the vagus nerve in the facial sheath named carotid sheath. 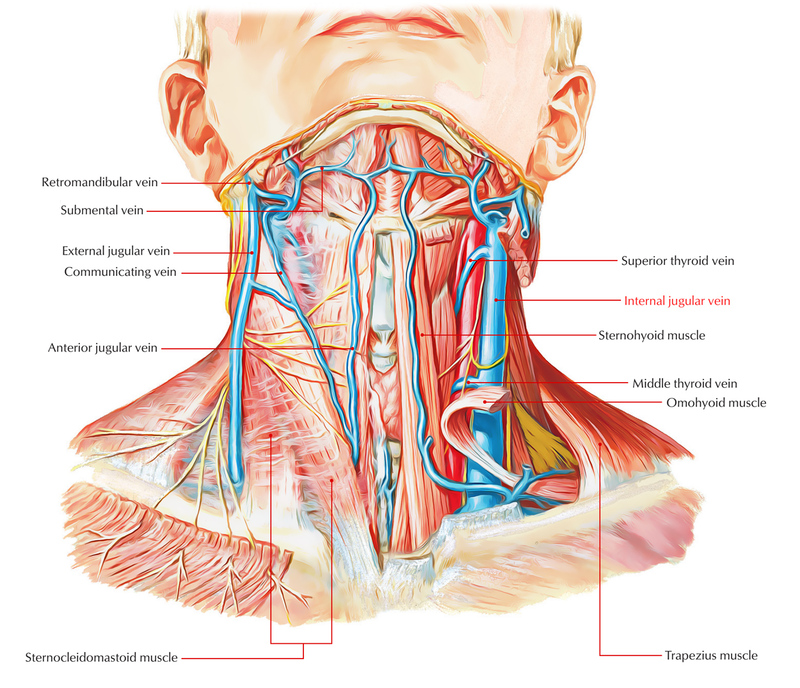 The deep cervical lymph nodes are located along its whole course. It’s remarkably constant in position and can be indicated on the surface by a vertical line going from midpoint between the tip of the mastoid process and the angle of the mandible, to the sternoclavicular joint. At the lower end, both the internal jugular veins (left and right) tend to shift to the right, so the right comes to be located farther lateral to the right common carotid artery while the left tends to overlap the left common carotid artery. 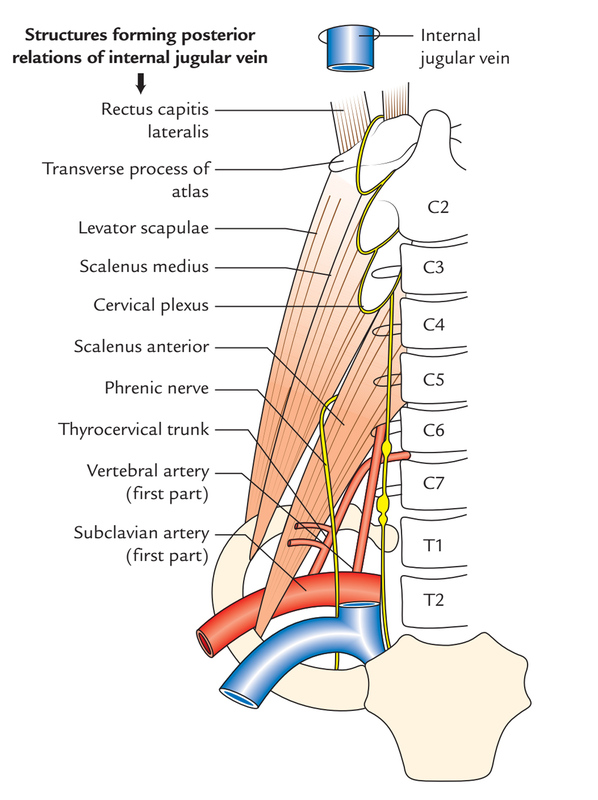 Scalenus medius and cervical plexus. Scalenus anterior and phrenic nerve. Thyrocervical trunk and first part of vertebral artery. First part of the subclavian artery. Thoracic duct on the left side. The sternocleidomastoid overlaps the upper part and covers the lower part of the vein. Posterior belly of digastric muscle in the upper part. Inferior belly of omohyoid in the lower part. Crossed by 1 vein: anterior jugular vein. Inferior root of ansa cervicalis (descendens cervicalis). At the base of skull the internal carotid artery is located in front of the internal jugular vein and the past 4 cranial nerves intercede between the vein and the artery. Internal carotid artery and 9th, 10th, 11th and 12th cranial nerves in the upper part. 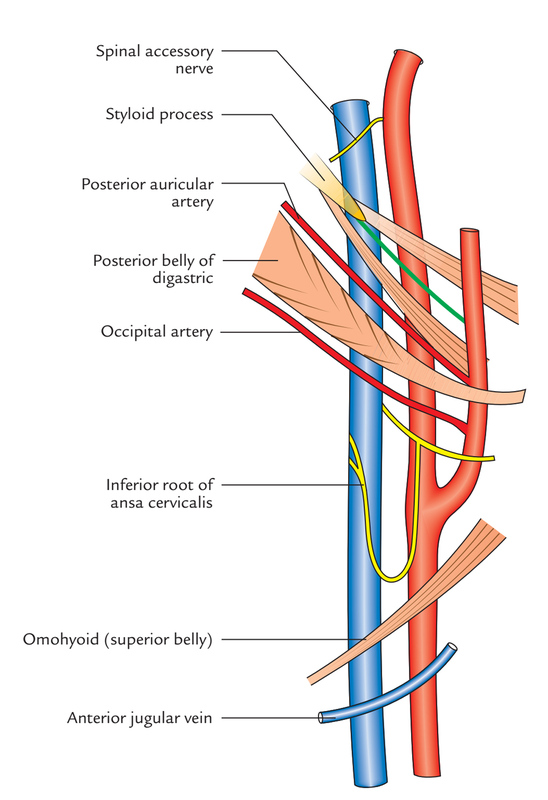 Common carotid artery and vagus nerve in the lower part. Inferior petrosal vein-is typically the very first tributary and joins the internal jugular vein immediately below the jugular foramen. 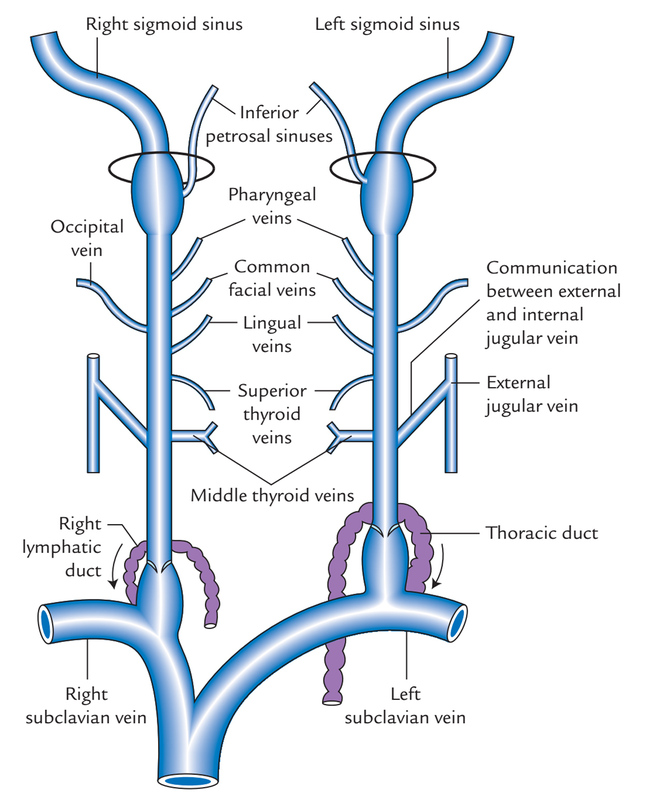 Along with the above-mentioned tributaries, the right lymphatic duct on the right side and thoracic duct on the left side, generally open into the internal jugular vein or into the junction between the internal jugular vein and the subclavian vein. In the upper part of the neck, the internal jugular vein may communicate with all the external jugular vein by an oblique jugular vein across the anterior border of sternocleidomastoid muscle. The internal jugular vein functions as a guide for surgeons during removal of deep cervical lymph nodes. The facial (or common facial) vein is the most essential tributary of the internal jugular vein for it acts as a useful landmark in the removal of the jugulodigastric (tonsillar) and upper anterior group of deep cervical lymph nodes. The malignant and tuberculous lymph nodes regularly get stuck to the internal jugular vein and not uncommonly the surgeon has to resect a portion of the vessel to be able to ease their removal. Occasionally a thrill is felt in the root of the neck (in lesser supraclavicular fossa) during contraction of atria in systole; especially in case of mitral stenosis. The vein is safely cannulated by adding a needle in the apex of the lesser supraclavicular fossa. The needle is pointed backwards and upwards to prevent the puncture of cervical pleura, which, if punctured, will cause pneumothorax.